JUST DONT PUT HIDDEN LAYERS BELOW! 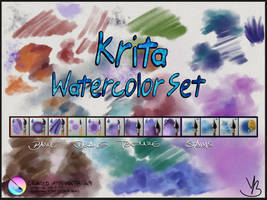 Do you have a tutorial for the newer versions of Krita? 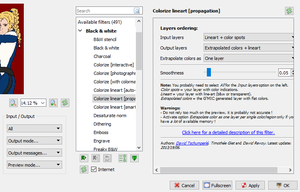 Because none of the menus are the same now, and "colorize [comic]" is no longer an option. I'm not quite sure how to get the filter to work. Nothing I've tried has gotten the result I wanted. Thanks for putting this together! I look forward to getting the damn thing to work. The G'MIC filter can now be found under Filter > Start G'MIC Qt. Go to Black and White > Colorize lineart [propagation]. 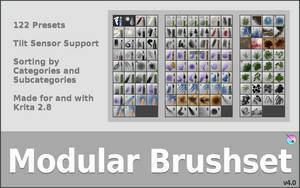 In the Input/Output box on the left, you need to select "All" for the inpute layers, but that's all you need to do. The rest of the settings are on the right, which you can see follow the tutorial from the OP Click apply and you're done! To the OP: thank you so much for this, it's going to save me so much time. This is gonna be a huge time saver. I need help. In my Krita, when I went to layers, there's no Apply G' Mic Action. Can you help? Never mind, I got that solve. But I have an problem. When I set Input layers to Lineart + Extrapolated colors, my color spots didn't color the whole thing. Can please help me on this? Sorry for not being here recently. Sorry for the late replay, anyways, where I could find that? Maybe I'm just stupid but I'm confused on how to set my layers. I obviously did it wrong considering this didn't work at all for me. It'd also help if there was a video tutorial I could watch, if that exists, could you please tell me where to find it? You have no idea what a life saver this is! I just finished a ref sheet in, like, half the time it usually takes (including coloring). Thank you!! Thank you! This was a fun thing to play with and amazingly it worked even on a fairly detailed piece. Please do! I will keep an eye out for it. Tried this in Krita. Works like a charm and sure will save time! Thanks for the detailed tutorial! I have Krita 2.9.8 and I don't have that. This is the best thing ever! so much time saved, I only wish I knew about it sooner. I've been using Krita for about six months now. I tried it and it crashed my computer And now Krita won't start up. Idk what happened but I think I have to re-install the program and see what happens.